The Aqua Terra, launched as a yachting oriented offshoot of the iconic Omega Seamaster in 2002, has always appealed to the maritime minded. Now the iconic Swiss watch brand has unveiled a fresh take on the sporty timepiece with the hopes that it will attract even more fans. 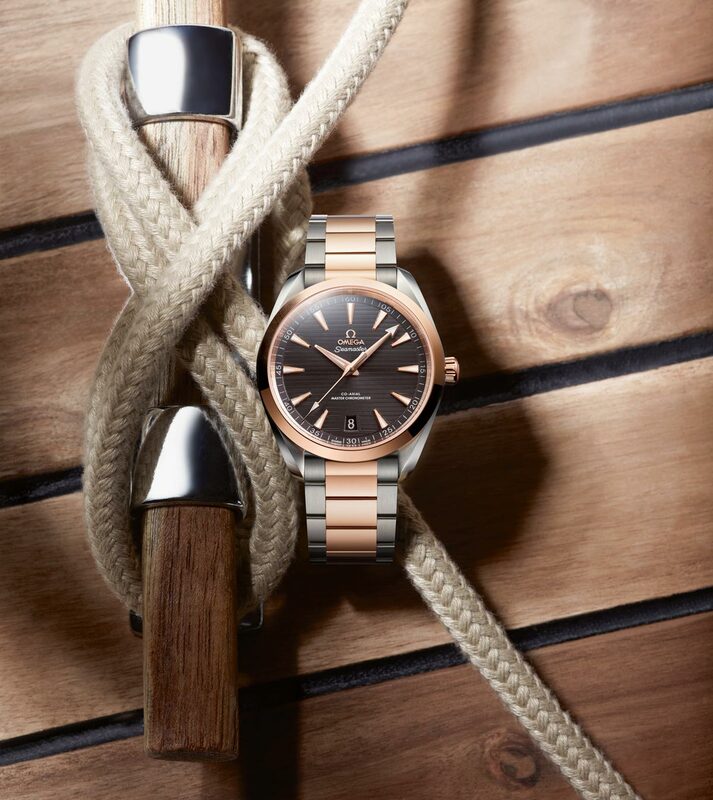 The most striking feature of the watch is a so-called “teak” dial, designed to evoke the deck of a sleek luxury yacht. 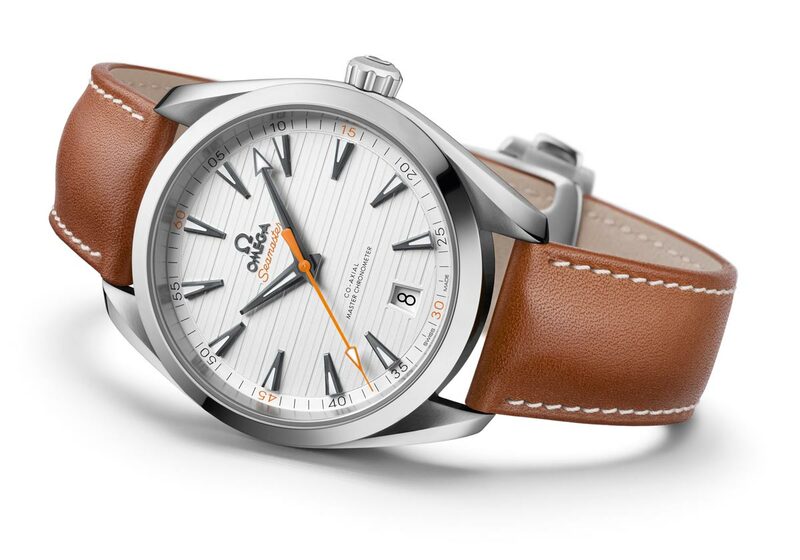 The OMEGA Seamaster Aqua Terra is made for the yachting community. For the 2017 redesign, the pattern now “sails” horizontally as opposed to vertically, with much better effect. The Aqua Terra dial was originally modeled on the second generation Seamaster 300, a watch made famous by James Bond. It has now been simplified with less text and a repositioned date window for a cleaner read, something 007 would appreciate under fire. 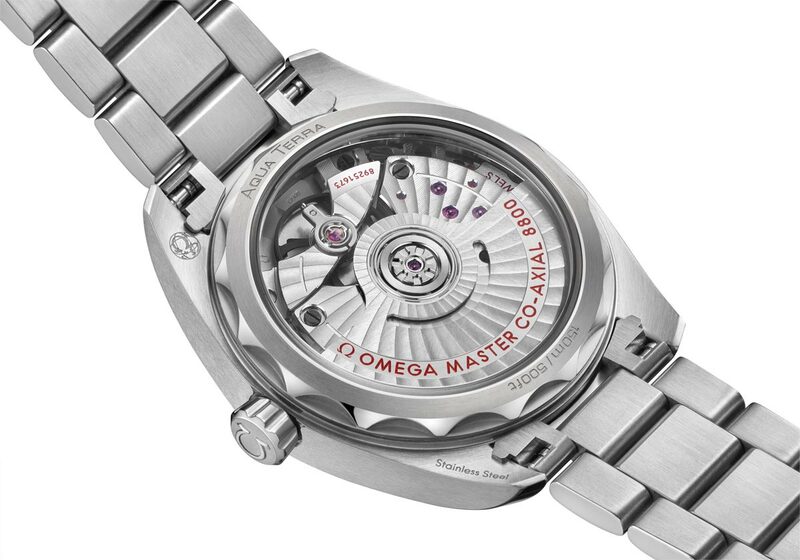 Here is the back of the OMEGA Aqua Terra. 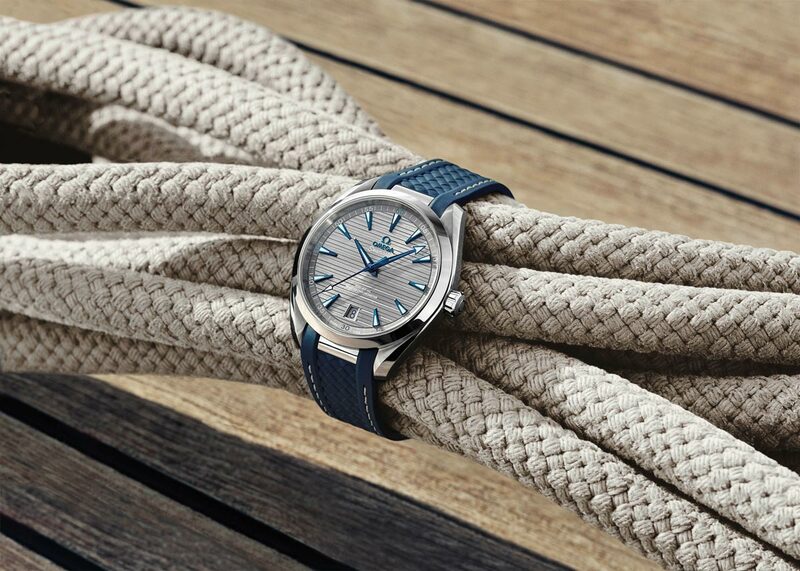 The new Aqua Terra is a watch for the yachting community. Omega’s sweet collection continues to grow with this Aqua Terra. Available in both 38mm and 41mm, the watch is powered by Omega’s Master Chronometer calibre 8900 / 8901 (41 mm) or 8800 (38 mm). The metal Aqua Terra bracelet has also been redesigned to achieve a better integration with the watch case. The dial on the Seamaster is called a Teak dial, it represents the boards on a yacht. Some 41 mm models now feature a rubber strap for the first time, integrated into the case by an additional stainless steel or 18K Sedna gold link. Or it leather or NATO straps suits your tastes you can pick those up. The Aqua Terra is also known by its wave-edged caseback design and “twisted” lugs. Omega has also come up with something special for the redesign of the collection: the 43mm Seamaster Aqua Terra Worldtimer Master Chronometer Limited Edition. It features a case made from a platinum-gold hybrid and a dial with an exterior surface of sand-blasted platinum-gold with 18K yellow gold indexes and hands coated in Super-LumiNova. In worldtimer tradition the dial features a circle of global destinations printed in red for GMT, black for +1h in summer, and blue for places without daylight savings. In a signature touch, the destinations include the city of Bienne at GMT+1, the home of Omega in Switzerland. The caseback features a wave-edged design and several engravings including the unique Limited Edition number of each piece. Powered by Omega’s calibre 8939, the Aqua Terra Worldtimer is water resistant up to 15 bar (150m / 500ft) and comes on a brown leather strap with a platinum-gold foldover clasp. With this OMEGA you can see the time in cities all over the world. Only 87 examples of the precious timepiece are being produced. 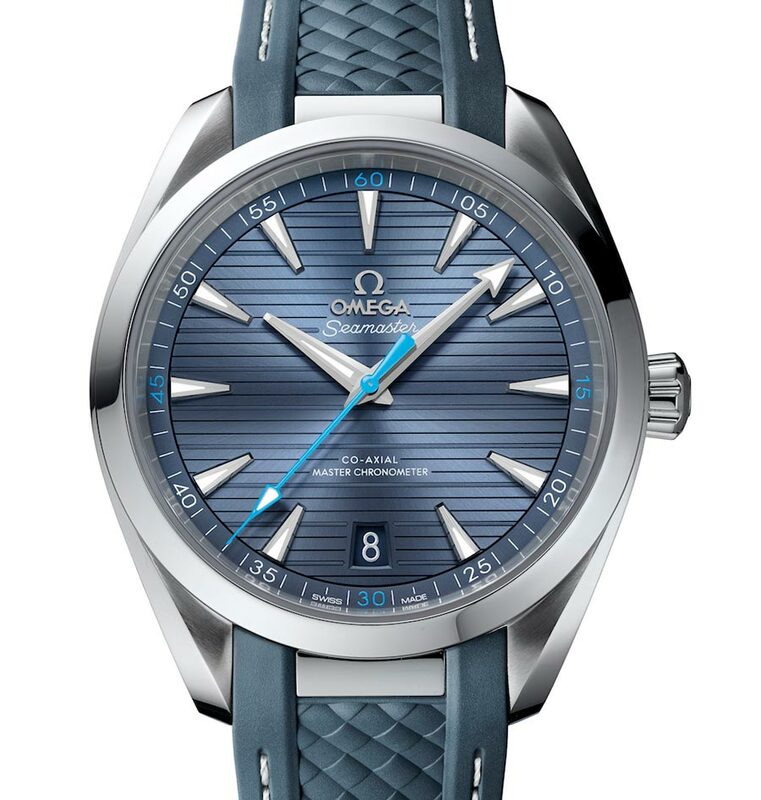 Omega has brought back Oscar-winning actor Eddie Redmayne to launch the new Aqua Terra collection. “Just like the watch, he embodies a dashing edge of classic style, but also has the ability to master the most complex challenges,” Omega notes. Here’s to smooth sailing. 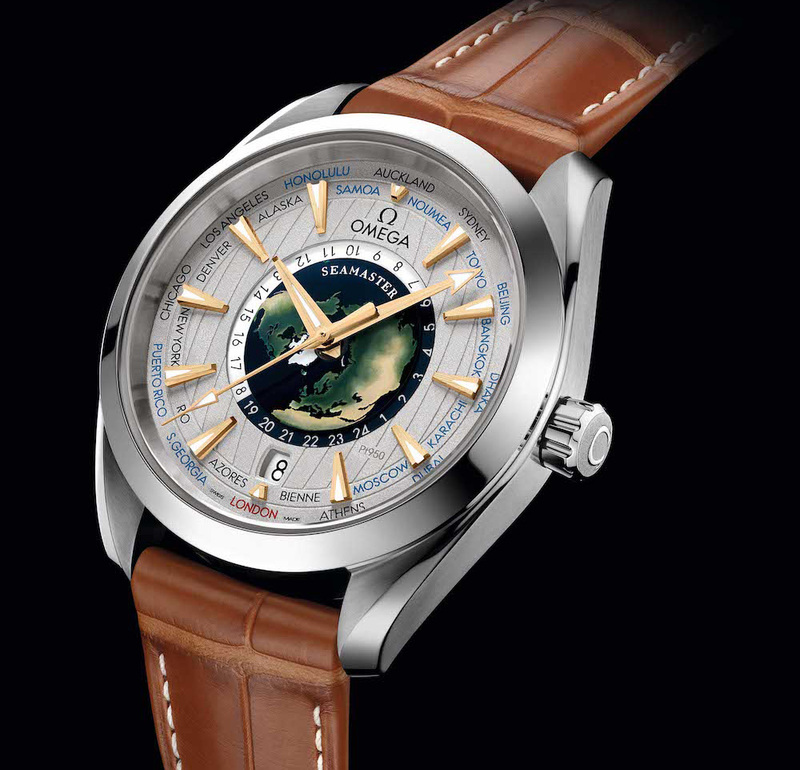 Here is a different iteration of the OMEGA Aqua Terra.